1. To consider and adopt the Minutes of the 14th Annual General Meeting held on 29 June 2018. 2. 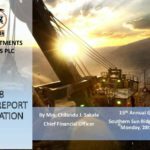 To receive and adopt the audited Financial Statements for the year ended 31 March 2018, together with the Reports of the Directors and the Auditors. 3. To approve the final dividend of K0.61 per share recommended by the Directors. 4. To consider and adopt the recommendation to appoint External Auditors for the year ending 31 March 2019, and to authorise the Directors to fix their remuneration. 5. To transact such other business as may properly be transacted at an Annual General Meeting.